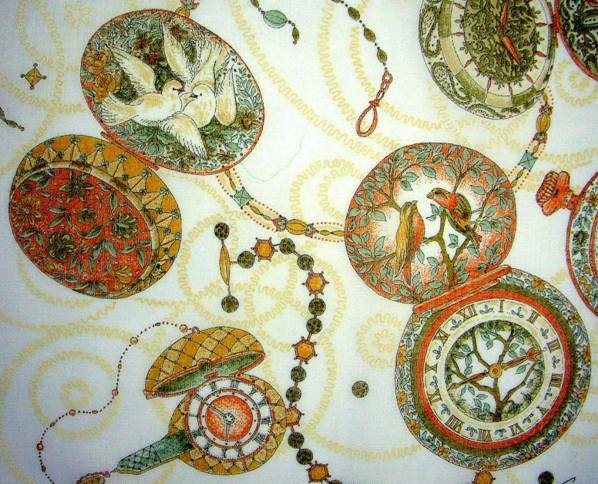 It’s paradoxical that the one thing we desire most, we often waste with reckless abandon… the gift of time. It’s a gift that if stolen or lost, can never be replaced. The longer one lives, the more one understands how limited is our time, and how helpless we are to conjure more. 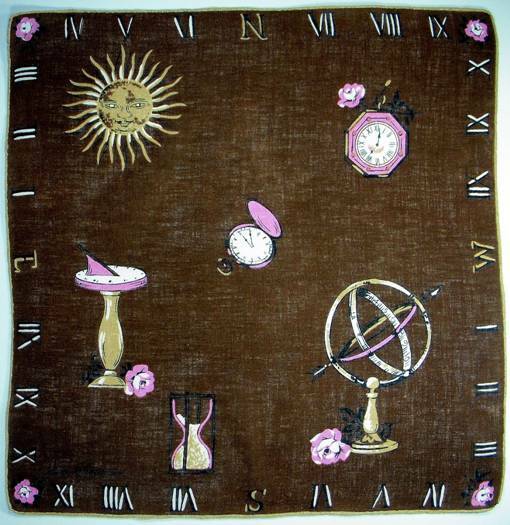 Whether via sundial, hourglass or timepiece, we watch the minutes slip by, helpless to halt them. 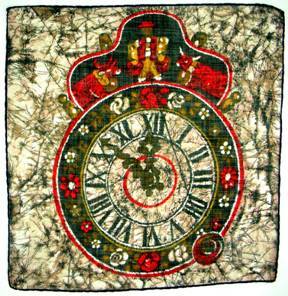 Whether president or plebeian, potentate or pauper, we are all subject to the same rule of time. Although there are almost as many cellphones (6.8 billion) as there are people on earth (7 billion) which also display time, the watch has become more popular than ever, from Patek Philippe to Breguet, Tag Heuer to Vacherrone. 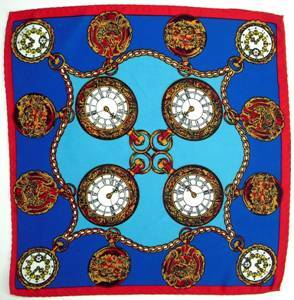 For some, it’s a love of fine craftsmanship, for others, a status symbol. For most, the watch may just be a convenience, as most cellphones are not yet waterproof. But wait! Could there be another reason? 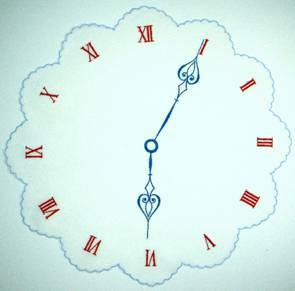 So – if your analog watch reads 12:15, and your friend says “I’ll meet you in half an hour” a study found that most people would look at their watch and (they didn’t even realize this until queried) envision a 30 minute ‘slice of pie’ on their watch, then held that image in their mind. The numbers were far less important that the ‘space’ on the watch face. Conversely, when wearing a digital watch reading 12:15, even though study participants knew their friend would at return at 12:45, they checked their watches 3 to 4 times more often. The numbers, though observed, didn’t register. They didn’t correspond to anything memorable. (i.e. 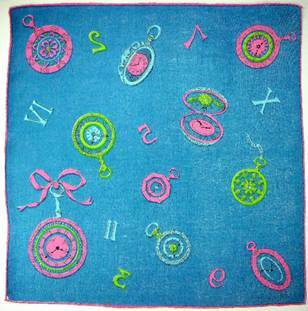 visual) The person had to continually ‘translate” the numbers into time. Interesting, no? Test this for yourself, the next time you ask a friend to “look at that adorable child, over there – at 11:00 o’clock.’” The clock face is so ingrained, it’s become a blueprint for directions. Watches are often given as gifts for special occasions, and hold special memories, much like a treasured piece of jewelry. 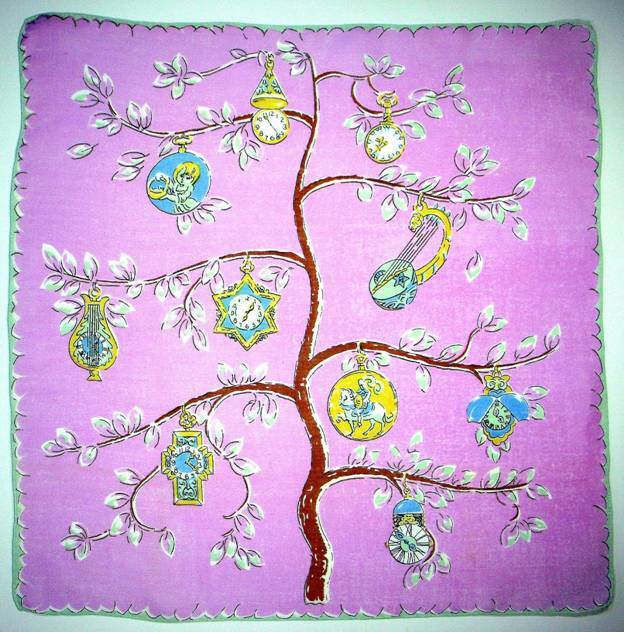 A spring tree abloom with lady’s pendant watches reminds us why we treasure these tiny timepieces. 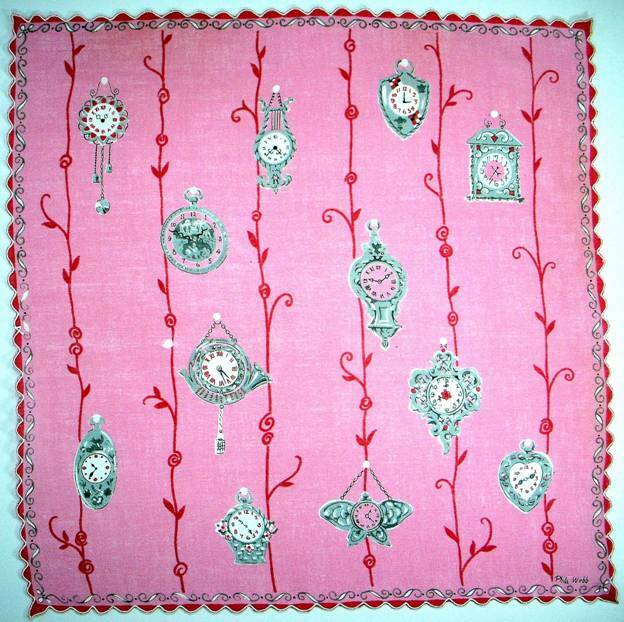 Additional pendant watches adorn this rose vined hankie, with several resembling miniature wall clocks. Note the wee weights and pendulum at 11:00 o’clock, the lyre timepiece at 12:00, as well as the hunting horn and butterfly. So charming. 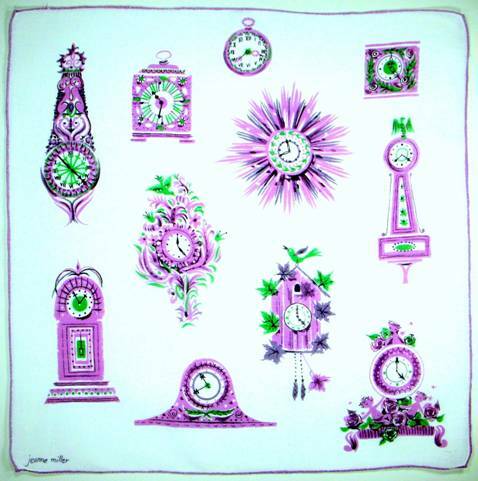 Regatta stopwatches hang from pier pilings strung with seashells, while alongside, fanciful hot pink timepieces swirl in a whirlwind of Roman and Arabic numerals. Fun! 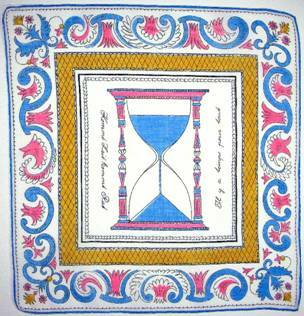 The hourglass on the left reminds: “Il y a temps pour tout” – There is time for everything, and “Kommt Zeit kom Rat” – Time will tell. 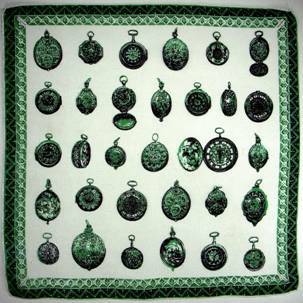 Stately mantle clocks and a plethora of pocket watches on chains remind us that time is of the essence. 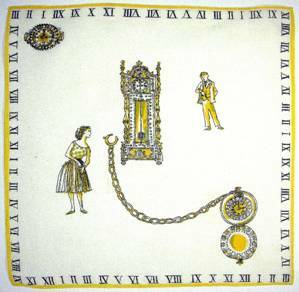 If we need auditory reminders, there is always the classic cuckoo clock. 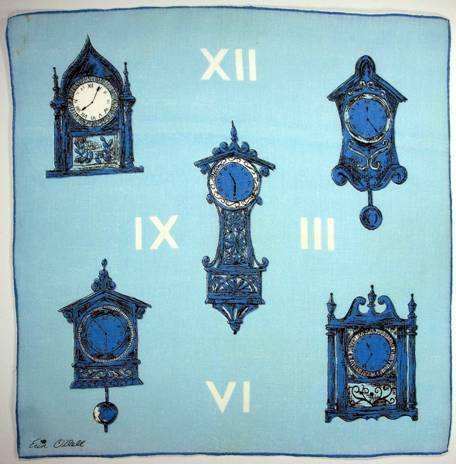 Just as people shopped for the perfect lamp or end table, the clock was considered not only functional, but decorative, and a reflection of the owner’s taste and style. 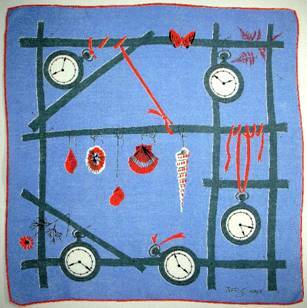 Its aesthetic appeal was carefully considered, and soon there was a timepiece for every taste. 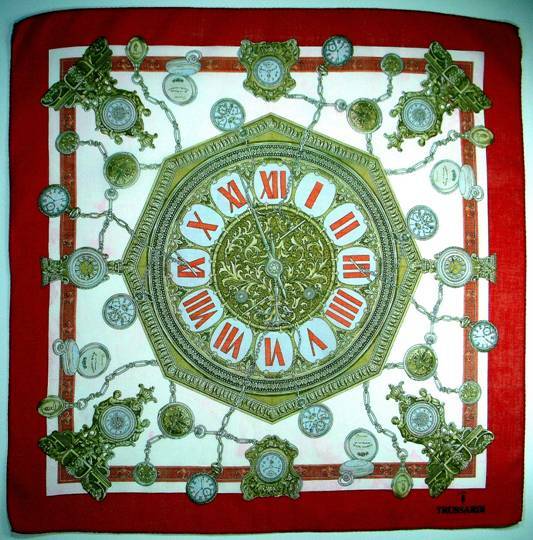 Below, the ghost image of a Roman numeral clock face anchors a bevy of elaborate timepieces. 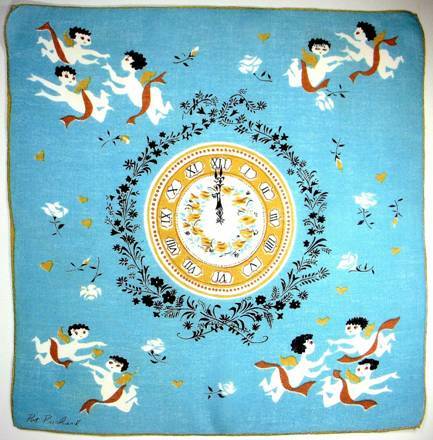 Fanciful cherubs frolic amidst a profusion of chiming beauties – everything from the Greek lyre, to the Egyptian obelisk, the classic Cartier, the glass domed anniversary clock, and more. 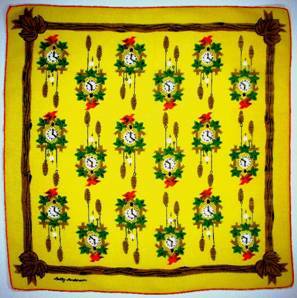 The hankie abouve is the first hankie we’ve seen where all the clocks are synchronized to the exact minute. It brings to mind a restaurant in Monterey, CA, called The Clock. 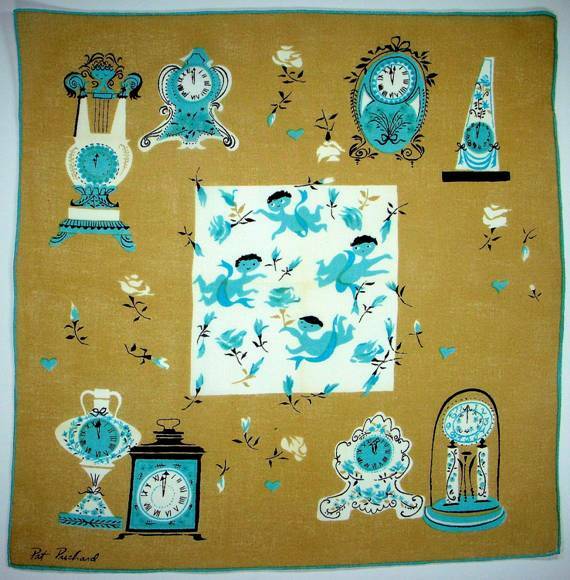 Cozy and quaint, fronted by a charming garden patio, its walls were covered with clocks – of all permutations – large, small, simple, ornate, silly, elegant, glass, brass, chrome, wood, you name it. On the hour, it was as if time stood still when hundreds of clocks would boom, bong, clang, dong, jingle, knell, sound, strike, tinkle, chime, gong, ring, and cuckoo with alarming alacrity. Conversation, of necessity, came to a dead halt, as patrons and wait staff alike surrendered to the melodious melee. It was great fun. 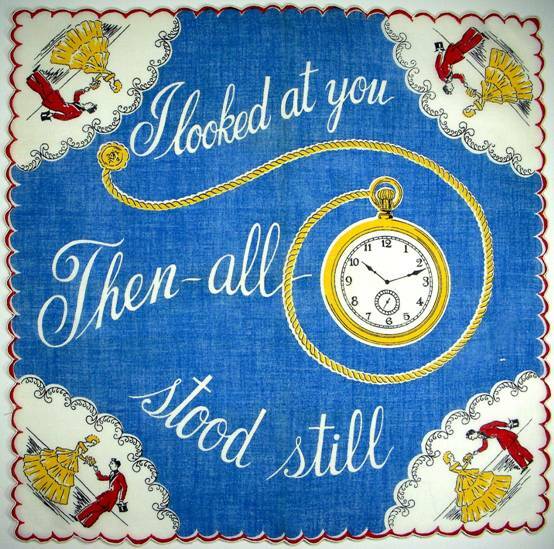 As the clocks would near the top of each hour, you could observe customers prolonging their meal (myself included) in order to enjoy the spectacle and cacophony all over again. 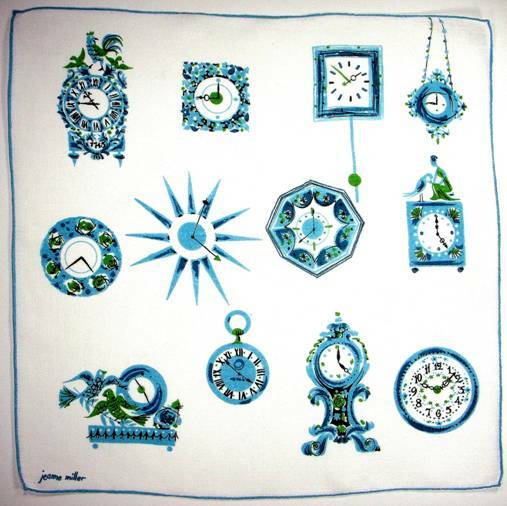 I miss those clocks (and the Greek lemon soup!). Anyone who has ever waited for a beloved knows that minutes seem like hours, and hours like days. You can literally walk yourself in circles, like our chap on the left checking his wristwatch for the umpteenth time, or the clock watching couple on the right. If you’ve viewed past blogs on Easter or Tea Time , you’ve seen Alice’s White Rabbit pop up. 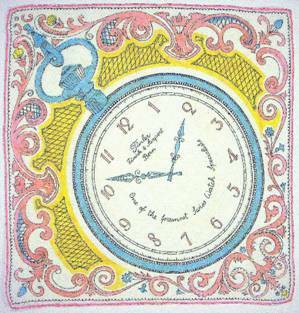 Obsessed with time, but perennially late, his pulchritudinous pocket watch is forever present. 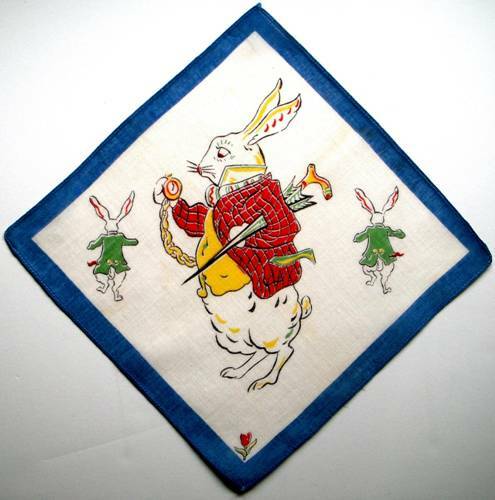 I doubly love this children’s hankie for the fact that our tardy bunny sports a hankie dangling from his pocket, as do the duplicate dandies who bookend our trusty timekeeper. Terrific! Our cherubs return to warn Cinderella to step lively! Midnight approaches! Even more direct is the fairy tale depiction below. Look closely. Instead of glass slippers, our heroine twirls en pointe in tiny ballet slippers. The brocade curtain frame indicates we may be viewing Frederick Ashton’s lovely interpretation of Cinderella at ABT. 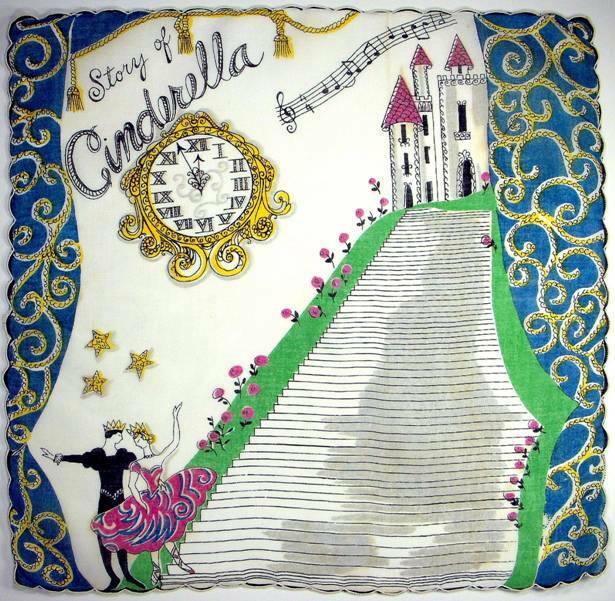 It’s not surprising our heroine would miss her fairy godmother’s deadline, for time has no meaning in the realm of romance. 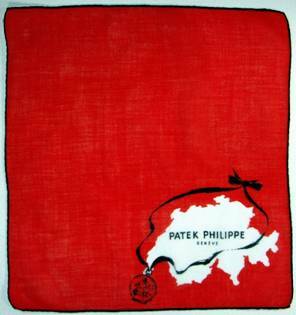 Our closing hankie says it all, and is one any woman would be honored to receive, and quite frankly flaunt from her pocket or tie to her purse strap, for all the world to see. 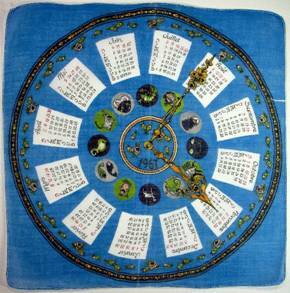 So there you have it, a profusion of pocket reminders which prompt one to treasure your time and your minutes like gold. Once lost, they are gone forever. Eerily, this song hit #1 on the charts fourteen weeks after Croce was killed in a plane crash. Another winner! I like Rod Stewart’s “Time After Time”. Thank you Ann, a good reminder. 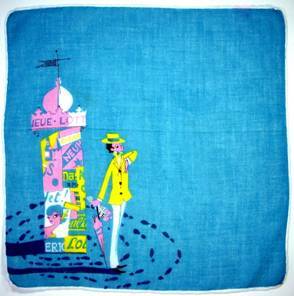 I am always amazed at your hanky collection! And your amazing word eloquence! 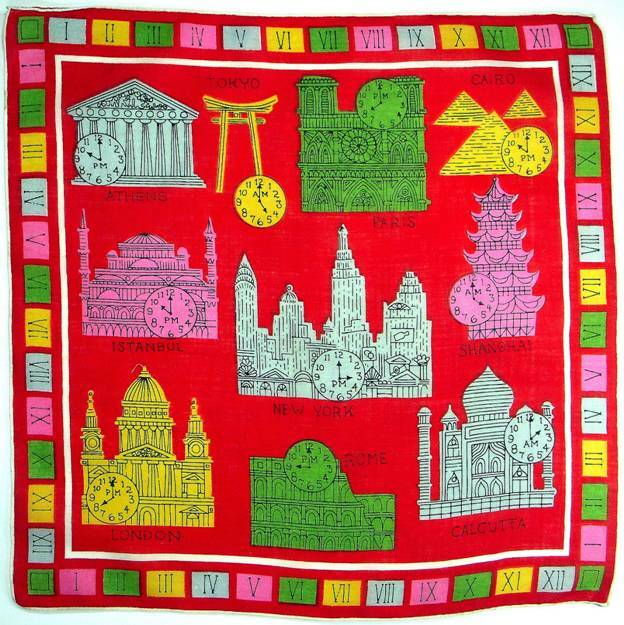 Time hankies remind me that I must get moving on the day. But thank you for a welcome respite, as I’ve already done some sweeping and cleaned some windows!